With a little extra time off during the holidays, a resourceful bowhunter can usually get into a tree stand a few more times. While I always hunt around my work schedule and the archery shop hours, during the holidays even if we have a Christmas party at noon I can be in a tree stand from daylight until 10 a.m. and make the party, no problem. Unless I mess up and shoot a deer! Through the years this is something Bonnie has gotten used to. Here it is almost Christmas, however, there still are a few shopping days left to come up with that special gift for any outdoors person on your list. The outdoors people on your Christmas list probably are the easiest to satisfy when it comes to giving a gift, but in case you are having some difficulty, here are some ideas. Since the movies “The Hunger Games” and “Brave” came out this year a lot of parents and Santa are getting requests for archery equipment for Christmas. Fog hovered over the lake the past three mornings, then cleared before noon, and bright sunshine finished the day. More of the same was forecast for the next day, when my brother-in-law Paul Cooper asked me if I wanted to fish in the morning. Of course, I wanted to fish, but what about the fog. So, next morning, we checked at eight, however the fog still was quite thick. Maybe, you could see a hundred yards. Land Between the Lakes is a great place to visit for non-hunters and hunters. If you don’t hunt, there are lots of things of interest and things to do. There are more than 200 miles of hiking and biking trails and back-country roads; 100 miles of trails at the Turkey Bay area for ATVs. Near the Wrangler’s campground there are 100 miles of horseback trails and there are 300 miles of undeveloped shoreline to be fished and explored. Last winter was much too warm for any ice fishing in this area, and it is a rare opportunity when there is enough good ice for safely trying your luck in this part of the country. Last year, there was very little good ice even in the far northern U.S. But when we do get a few winter days with safe ice, it is fun to catch fish through the ice, and it seems like the cold water makes whatever fish you catch mighty tasty. About the time hunters are heading to the woods for deer gun season, some hardy anglers are preparing their equipment for sauger fishing. When the weather starts cooling significantly, maybe even getting lousy, that’s when sauger fishermen begin their season. It almost seems the worse the weather, the better for sauger fishing. 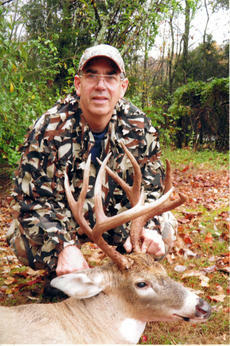 My son, Eric, had taken a wide 10-point buck the morning of Oct. 26, so I had high expectations as I got up at 6 a.m. the next day for my 15th hunt of the 2012 season. After getting dressed, I stepped out onto the porch and was greeted by a cold, wind-blown drizzle. I started to go back to my warm, dry bed, but I knew if I did I would just toss and turn thinking I should be in a tree stand hunting. Thanksgiving is a special holiday. It means different things to different people. It is celebrated in different ways. For nearly all, it involves food. For many years in the Junker family, the day involved a hunt for the guys before a big early-afternoon meal. Whether or not any game was taken on the hunt really didn’t matter. It was more about getting out together. It was about tradition. It marks the day I shot my first rabbit with a BB gun when I was probably 9 or 10. Thursday, Oct. 25, would be the first vacation day for my son Eric and he would be off until Monday, Nov. 12, giving him plenty of time to take advantage of hunting the rut or breeding season of the whitetail deer. With the rut starting in earnest, the bucks are chasing does and they seem to not care where or when they go anywhere — including the roadways. At this time of year I start seeing more deer hit by vehicles and I hear warnings on the radio and even occasionally on the television about the increased deer activity and for drivers to be cautious.